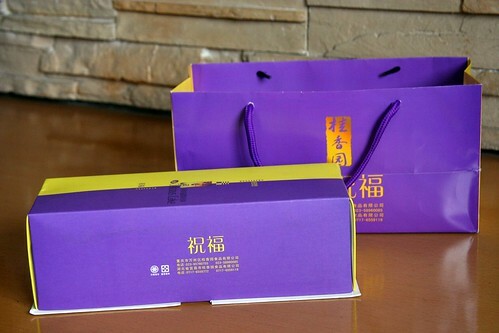 Among expat circles Mooncakes are sometimes treated like fruitcake. We happen to like fruitcake. 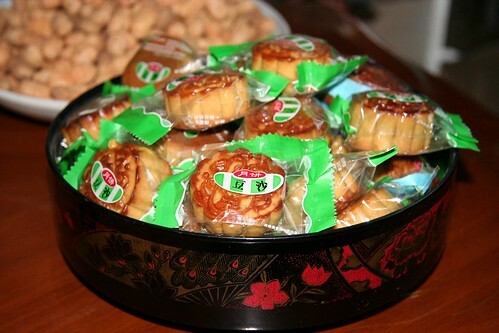 Sandra also happens to like some mooncakes. Think quasi fig newton! 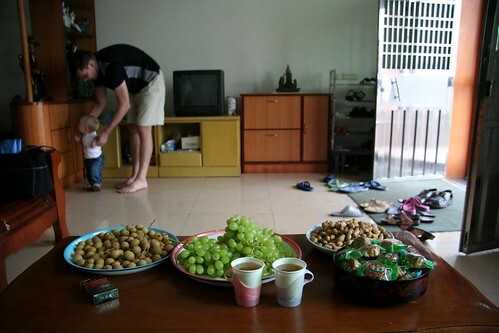 Her favorite are the red bean, the gummy fruit filled ones and the nutty ones. 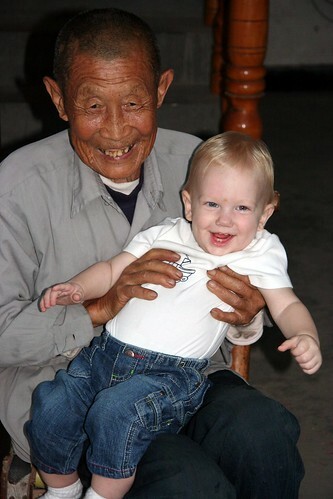 Shorel hasn’t found a mooncake yet that he really enjoys. He says, “They’re just alright.” We try to avoid the egg and meat ones. 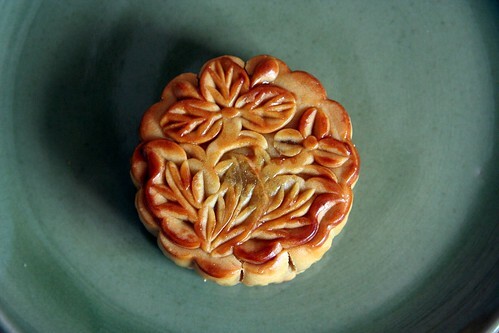 This mooncake had pineapple inside. Delicious! 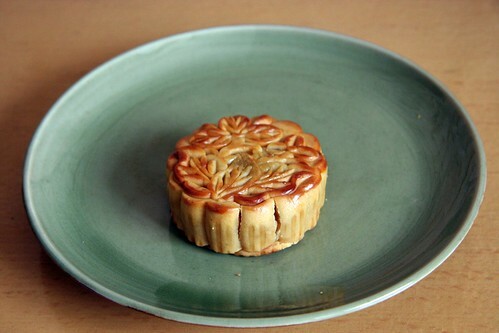 Sandra tried to find a mold downtown to make her own mooncakes, but the shop that had them is no longer there. We’re not sure where it moved to. 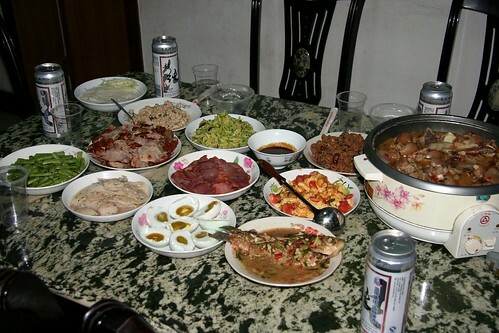 That evening, we walked over to our friends house for a delicious dinner. 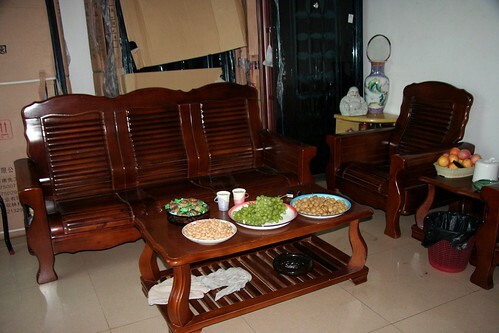 Here, you can see a popular furniture available all over China. These days, Chinese people enjoy both a plush leather sofa or this more traditional furniture which is wooden and without cushions. Here’s a typical scene. 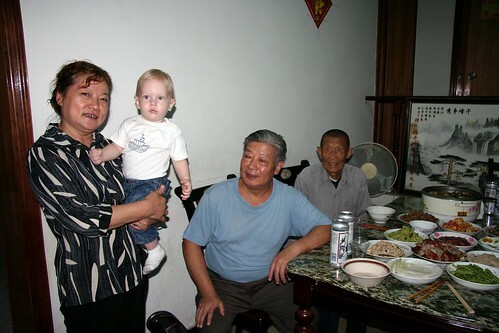 Since Chinese food is all cooked fresh in the wok, it is common to welcome your guest with fruit, peanuts, tea, a pack of cigarettes and of course – mooncakes. We also always take our shoes off at the door. Slippers will be provided. Although Shorel normally goes sans slippers since they are usually not a size 14. These 10 dishes plus a crockpot full of soup were all lovingly prepared for the Mid-Autumn Festival. It was so much food! What a wonderful evening with friends! After our meal, we took a moment to stand outside and enjoy the full moon. Then, Schäfer reminded us it was way past his bedtime.